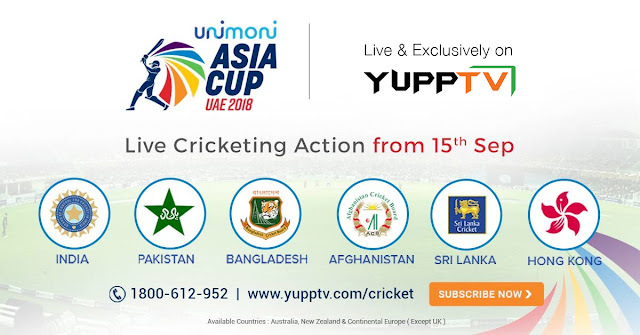 New Delhi, September 10, 2018: YuppTV, the world OTT leader for South Asian content has bagged the exclusive digital rights for ASIA CUP 2018 in Australia, New Zealand, and all countries under Continental Europe. Commencing on the 15th of September, the ASIA CUP 2018 will host dynamic cricketing action between India, Pakistan, Sri Lanka, Afghanistan, Bangladesh and the winner of Asian Cricket Council qualifier, till the 28th of September. Following the latest development, cricket enthusiasts can catch the action LIVE on YuppTV. This year, the ASIA CUP will be held in Abu Dhabi and Dubai. Cricket lovers can subscribe for the series at www.yupptv.com and watch the action live on YuppTV. Users can also enjoy the matches LIVE on-the-go via YuppTV app on their IOS and Android smartphones or any internet enabled device. YuppTV is one of the world’s largest internet-based TV and On-demand service provider for South Asian content, offering more than 250 TV channels and 3000+ movies in 13 languages. YuppTV, received funding from Emerald Media, a Pan-Asian platform established by leading global investment firm KKR for investing in the media and entertainment sector, wherein Emerald Media acquired a significant minority stake in the company for US$50mn. YuppTV had earlier raised its Series A round of funding from Poarch Creek Indian Tribe of Alabama. Visit https://www.yupptv.com/cricket/asia-cup-2018-live-streaming for the most thrilling, callously emotional and relentlessly exciting India vs Pakistan match.